The Sunny Bird PR team are celebrating our five-year clientversary with our longest standing client, Good Night Anti-Snoring Ring! The Good Night Anti-Snoring Ring team came to us back in 2013 asking for PR support to introduce their innovative anti-snoring ring to the consumer market. Over the past few years, we’ve achieved a multitude of coverage through a carefully devised social media strategy and a mix of blogger reviews and press features. 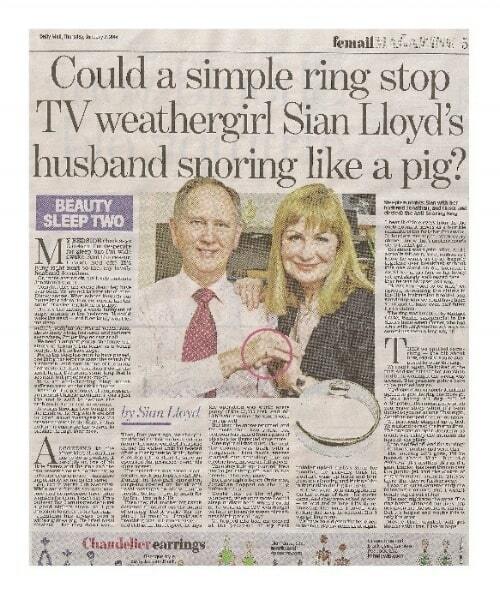 The Good Night Anti-Snoring Ring has featured in the Daily Mail and Mail Online eight times, as well as a wide range of weekly magazines including Bella, Prima, Take a Break, Pick Me Up and Top Santé achieving an overall reach of nearly 90 million people and an advertising equivalent of £900,000 to date! Despite working on the account for five years, we’ve not run out of creative ideas and are still delivering results year on year. This year was no exception; the Sunny Bird PR team have secured numerous features showcasing the non-invasive, natural ring in target titles such as Health & Wellbeing, Woman’s Own, Chat and My Weekly! To secure these articles, we spent time speaking to journalists about their forward features and pitched the Good Night Anti-Snoring Ring for relevant slots on sleep and wellbeing. Where appropriate, we sent product to journalists for them (or their partners!) to try out. This active outreach resulted in the ring featuring in a mix of articles including product round-ups, health features and even a vlog showcasing the ring. One of our most successful campaigns this year was Father’s Day where the team worked hard to secure slots for the ring in multiple Father’s Day gift guides. Playing on the stereotype of snoring dads, we positioned the Good Night Anti-Snoring Ring as the perfect alternative present to the same old socks, guaranteeing fathers across the country, and their long-suffering families, a peaceful night’s sleep. The fun twist on Father’s Day resulted in a plethora of coverage on blogs such as Just Average Jen, with online views of over 43,000, and Emma Drew’s online vlog. With Father’s Day barely over, Christmas in July began! We applied the same outreach method as before and positioned the Good Night Anti-Snoring Ring as a stocking filler staple for Christmas gift guides. The team pitched the ring to consumer titles as well as family and lifestyle blogs and sent samples to journalists. Based on our success last year, we should see Good Night Anti-Snoring Ring in a whole range of different media titles this festive season. Year round, one of our major ongoing PR activities for the Good Night Anti-Snoring is to ensure the brand has an engaging social media presence to attract the attention of potential customers. Each week, we devise a strategy for the Twitter and Facebook channels and post original content to increase views and organic impressions. Key statistics for each channel, such as reach and engagement, are analysed weekly to determine which posts perform best and how we can modify this for the best results week-on-week. Our favourite, and most well received posts this year, have been quizzes on which animals people snore like, humorous memes on being sleep-deprived and adorable videos of family pets snoring. The most successful social post of the year was a competition offering the brand’s followers the chance to win a snoring ring. These posts do wonders for boosting engagement rates as competitors are encouraged to comment for the chance to win and tag their friends in need of an anti-snoring ring. This year, we increased Good Night Anti-Snoring Ring’s Facebook impressions by 123% through competitions alone! Our final campaign this year was for the launch of the Good Night brand’s new product, Good Night Sleeping Beauty; a beauty collagen drink designed to support your skin, hair and nails as you sleep. Just weeks since the project launched, it was shortlisted for Best New Beauty Supplement in the OK! Beauty Awards. From a PR perspective, the Sunny Bird PR team set out to increase brand awareness through a social media campaign designed to drive traffic to the voting site. Voting closes on the 9th November and results will be announced at the awards ceremony at the end of the month. Thanks to a structured PR strategy, thorough campaign research, and a great product, the Sunny Bird PR team have helped Good Night Anti-Snoring Ring reach almost 2 million people this year. With the brand set to expand its product range across the health and beauty sector, the Sunny Bird PR team cannot wait to see what the next 12 months bring!